TVCC dropped a conference home game Saturday night and fell to 1-2 on the season. The Tyler Apaches (1-2) rolled to a 37-24 win over the Cardinals behind the power of their running game, gaining more than 300 yards on the night and rushing for three touchdowns. 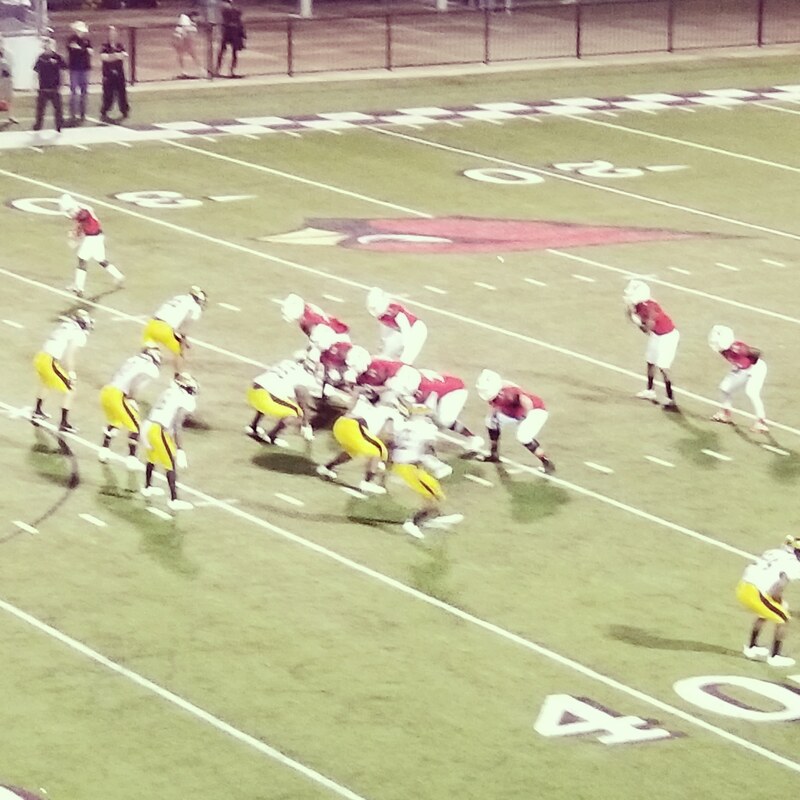 The game left both teams at 1-1 in the Southwest Junior College Football Conference. There are always Cardinal game balls to hand out, even on a disappointing and wet evening, so here they are. — TEVAN MCADAMS: McAdams is a flat out beast on the defensive line. Saturday night, he terrorized the Apaches and came up with a sack and a fumble recovery. — KORY TOLIVER: Speaking of the D-line, Toliver had a fumble recovery for the Cardinals and also pressured the Tyler quarterback multiple times. — ELIJAH WALKER: Walker may have been an unknown to Cardinal fans when he took over at quarterback on the last play of the first quarter, but he won’t be an unknown for long. The recent transfer from Louisiana Tech provided an instant spark for the offense and threw for 187 yards and two touchdowns, plus ran for 22 yards. Unfortunately, he also threw two interceptions. On one of those he was hit as he released the ball, which went straight up in the air like a punt before being picked off. — TYR’K BARNES: Barnes is a threat to go the distance every time he touches the ball and had over 100 all-purpose yards on the night when you figure in his kick returns. He also had touchdown receptions of 31 and 34 yards. Keep an eye on that Walker to Barnes connection as the year goes on. — JALIN THOMAS: Thomas surely made the most of his touches Saturday night. The freshman running back had four runs and one catch for 106 yards, including a 10 yard rushing touchdown. — CEDRICK WILLIAMS: Amazing interception by Williams on the goal line to stop an Apache scoring threat in the third quarter. Williams was able to return the ball all the way to the Tyler 25, but his return was brought back because of a penalty. I also had one thing get on my radar in a negative way: the Tyler Apaches postgame celebration, which included a lot of whooping and dancing and throwing of drinks in the air after the two teams shook hands and long after the final whistle. I get that it is a rivalry game and a big conference win on the road, but maybe you shouldn’t act like you won a trophy after a game in September when you are still under .500. Just sayin’. The Cardinals hit the road again next week, traveling to Oklahoma to take on NEO. Kickoff is scheduled for 6 p.m.